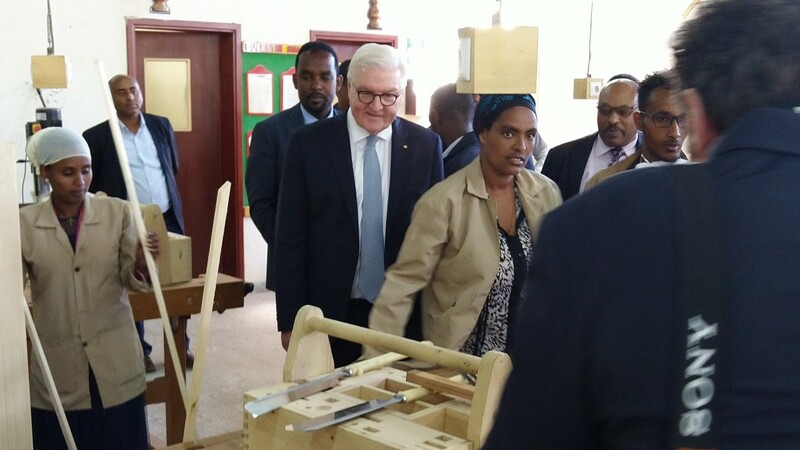 Together with an economic delegation, Frank-Walter Steinmeier spent three days in Ethiopia at the end of January. The German President held political talks with President Sahle-Work Zewde and Prime Minister Abiy Ahmed in the capital Addis Ababa. The agenda also included a visit to the TVET Institute, a training centre for vocational school teachers funded by KfW Development Bank. Abiy Ahmed was elected Prime Minister of the country in April 2018 and has already initiated extensive reforms. He has released political prisoners, sought talks with opposition members, offered peace to the country's long-standing enemy Eritrea and announced free and fair elections for 2020. The challenges facing this emerging country are still huge: poverty and unemployment are high, and ethnic conflicts frequently cause unrest. But since 2005, Ethiopia's economy has seen annual growth rates of between eight and twelve per cent. Many companies need qualified specialists but are unable to find any. In the Ethiopian government's National Development Plan, the education sector plays a key role in advancing the country's economic development and creating opportunities for its growing population. To get an impression of the situation in vocational education and training, the German President's delegation visited the TVET Institute (TI), which received EUR 4 million in funding from KfW Development Bank. The TI, founded in 2010, trains vocational school teachers and practical trainers from companies. 3,000 students from various disciplines are taught by nearly 70 instructors. To date, KfW has financed equipment for workshops for construction and ICT professions and teacher training, among other things; in future, mechatronics, electronics and textile/leather processing will be added. It is important that the training has practical relevance – this is ensured by involving industry and the private sector in the development of professional profiles, curricula and school equipment.